Getting to the Stanford Park Hotel could not be more convenient. We are located approximately 45 minutes driving South of San Francisco and 30 minutes driving North of San Jose. 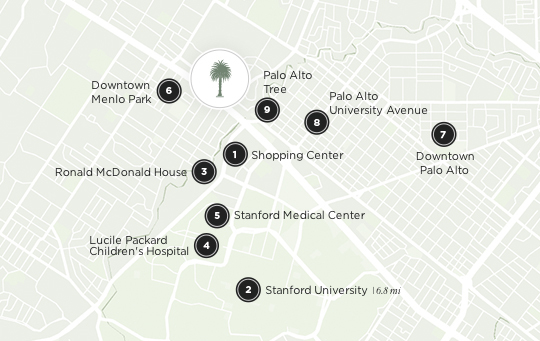 Alternatively, we are located just 10 minutes walking distance from the Palo Alto Caltrain station. If you are traveling from the city of San Francisco, you may choose either the 101 Southbound link for directions or the 280 Southbound link. Take the Willow Road exit (west) to Menlo Park, then make a left onto Middlefield Road. Follow Middlefield Road to Lytton Avenue, turn right, and follow Lytton Avenue through town until it ends. Turn right onto Alma Street, which merges into El Camino Real. The Stanford Park Hotel will be the first driveway on the right. Take Embarcadero Road Exit (west) toward Stanford University. Follow Embarcadero Road approximately two miles to El Camino Real, make a right, and head north on El Camino Real. The Stanford Park Hotel is one mile ahead on the right-hand side, just past the Stanford Shopping Center (on the left). Take Sand Hill Road East exit, and proceed on Sand Hill Road approximately three miles until it ends. Make a left onto El Camino Real. The Stanford Park Hotel will be the first driveway on the right, approximately 200 yards after making the turn onto El Camino Real. Follow signs out of airport to Highway 101 South. Take the Willow Road exit (west) to Menlo Park, and make a left onto Middlefield Road. Proceed on Middlefield Road to Lytton Avenue, then turn right onto Lytton Avenue. Follow Lytton Avenue through town until it ends. Turn right onto Alma Street, which will merge into El Camino Real. The Stanford Park Hotel will be the first driveway on the right. Follow signs out of airport to Highway 101 North. Take California 87 Northbound toward US 101 North, then take exit 9B on the left to merge onto US 101 North. Take the exit for Embarcadero Road and turn left at the fork. Follow signs for Embarcadero Road/Oregon Expressway, and keep left at the next fork. Follow signs for Embarcadero Road West and merge onto Embarcadero Rd, then keep left at the fork. Turn right onto El Camino Real. The Stanford Park Hotel is one mile ahead on your right just past the Stanford Shopping Center.